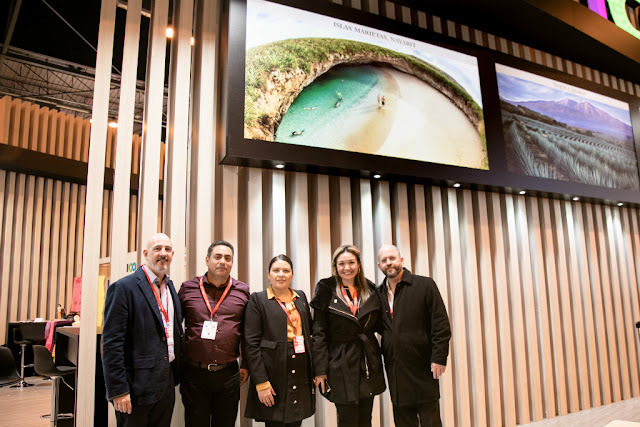 The growing trend of positioning Mexico’s Pacific Treasure on the national stage was on full display during the most important tourism fair in the world. The goal of projecting the Riviera Nayarit as a leading luxury market destination in Mexico came to fruition during the 39th Feria Internacional del Turismo (FITUR)—that took place in Madrid, Spain, from January 23-27 and is considered one of the most important tourism fairs in the world. The Riviera Nayarit and the Bahía de Banderas Hotel and Motel Association together with the Puerto Vallarta Tourism Trust were part of the Mexico pavilion. They once again participated in this important fair to maintain a presence in Europe, which is the third international market of origin to this destination. Interest from businesses and consumers was soon evident and the Riviera Nayarit Convention and Visitors Bureau (CVB) had meetings for three days straight with top commercial partners and potential wholesalers; among these, Sandra Eldjouzi, who handles the Riviera Nayarit/Puerto Vallarta account at TUI UK tour operator. Included in the topics was a strategy to continue strengthening the marketing in Manchester and the UK, as well as new challenges as they appear. 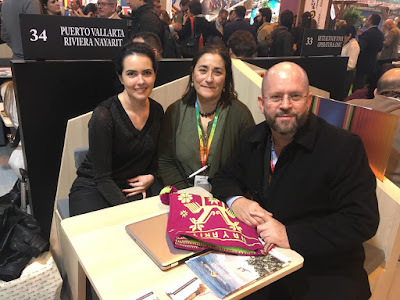 The meeting with Eldjouzi was very important, especially after TUI announced last November it will add a second frequency on the Manchester-Puerto Vallarta/Riviera Nayarit route, set to begin in winter 2019-2020. Another notable meeting to review the Riviera Nayarit product was held with the product manager for wholesale producer TRAVCO, headquartered in the United Kingdom. TRAVCO has nine offices established in the UK, as well as six in countries such as Spain, Germany, Italy, Canada, Argentina, and the United States. 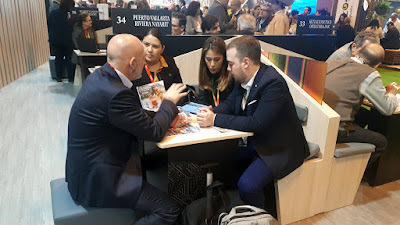 The South American market was also at the meetings, with whom the team was able to update strategies with top Colombian travel wholesaler Éxito and Euroandino, an important wholesaler from Chile. There were 21 business meetings held during the first three days with an additional two days of presence at the fair mingling with the general public. 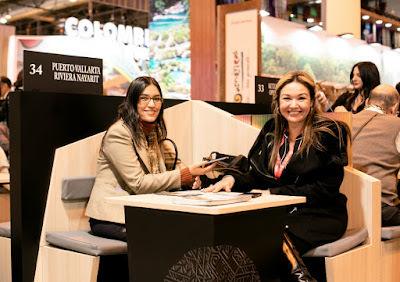 This brought to a close the intense participation of the Riviera Nayarit in FITUR 2019, which this year reported a record 253,000 attendees—an increase of 0.7% over last year with 1.8% more professionals (142,642) in its first three days. The CVB also conducted important interviews with print, electronic, and digital media from Spain, the US, and Latin America during the fair, among them: Excelencias-Caribbean News, El País, Revista Avenue, Food & Travel, In&Out, TusDestinos. Net, El Financiero, Negocios y Convenciones, Expreso Alicia, Cerodosbe.com, El Mundo en tu bolsillo, and radio shows Radio Nacional de España-Hora América and Radio Euzkadi-La Casa de la Palabra. A presentation cocktail sponsored by the Nayarit Ministry of Tourism and the Riviera Nayarit Convention and Visitors Bureau was held to strengthen bonds with media and public relations agencies. The invitation was extended by Newlink Spain, representatives for the CVB in this country; attendees included international media such as Traveling, Traveler, Elle-Blog La Chica de la Ciudad, Ladevi, El Heraldo de México, El Souvenir, Travel & News, Panrotas, Condé Nast Traveler México, Forbes México, Chilango, and Food & Wine México, among others. The Riviera Nayarit Convention and Visitors Bureau (CVB) and the Bahía de Banderas Hotel and Motel Association (AHMBB) continue to strengthen the promotion of the destination, helping position it on the domestic map with the support of the Government of the State of Nayarit via the Tourism Promotion Trust (Fiprotur).